This painting was accepted into the 53rd NOAA juried exhibition and received an Honorable Mention Award. The exhibition travels from September 2009 to September 2010 across 11 galleries in N. Ontario. To purchase cards or prints click here! approx. size: 6" x 8"
View this portrait's work in progress here! 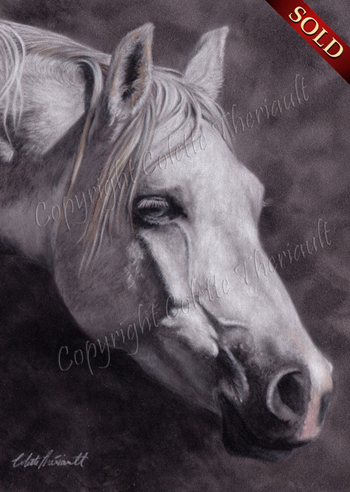 A beautiful grey Arabian horse stepping out into the sunshine on a warm sunny morning. This portrait was created using soft pastel pencils on gray suede mat board. This small painting would not be considered a miniature but the small size is an attractive feature when considering where to hang or place the framed portrait as it does not take much room. Many more wildlife watercolor, acrylic and pastel paintings, graphite pencil, colored pencil and charcoal drawings and sketches of animals and pets can be found in my art gallery. See portraits of dogs, puppy, cats, kitten, horses, pony, fancy rat, birds, elephant, butterfly, rhinoceros, jaguar, moose, raccoon, red fox, rabbit, hare, lion, zebra, owl, wolf and more. Commission an original custom wildlife painting or drawing, dog portrait, cat portrait, horse portrait or other animal portrait today. These original, hand-made, custom pet portraits and wildlife paintings or animal drawings make wonderful memorial gifts for every dog, cat, horse or animal lover. Gift Certificates now available! A custom pet portrait makes a wonderful pet memorial gift! Copyright Colette Theriault, All Rights Reserved.